Product prices and availability are accurate as of 2019-04-18 21:54:20 EDT and are subject to change. Any price and availability information displayed on http://www.amazon.com/ at the time of purchase will apply to the purchase of this product. Dataproducts premium remanufactured print cartridges help you get more for your money while performing as well as OEM cartridges. 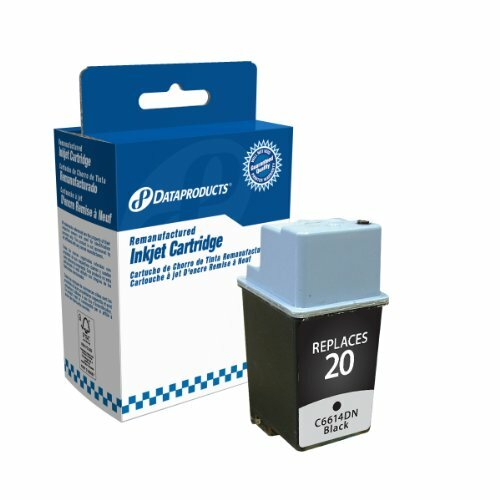 Dataproducts ink cartridges are developed and manufactured in state-of-the-art facilities utilizing technology and automation to ensure consistent, high quality printing. All Dataproducts cartridges go through rigorous pre and post testing and are backed by a 100% satisfaction guarantee. Dataproducts helps to protect the environment by keeping used cartridges and cartridge components out of landfills. This inkjet cartridge is compatible with HP DeskJet 610C, 610CL, 612C, 630, 630C, 632C, 640C, 642C, 648C, 656C, 656cvr; FAX 925xi, 1010, 1010x, 1020, 1020xi, 1040, 1040xi (HP 20) . It yields 500.